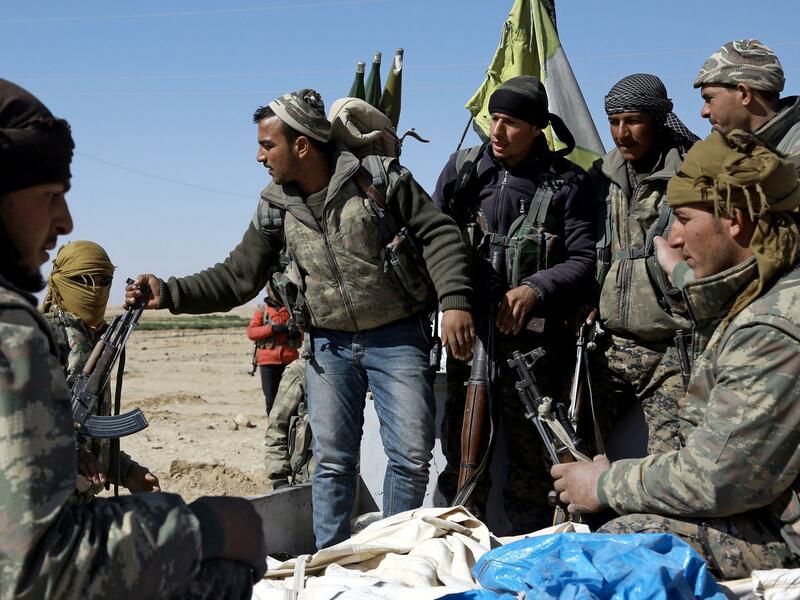 U.S.-backed Syrian Democratic Forces, made up of an alliance of Arab and Kurdish fighters, regroup on the northern outskirts of Deir Ezzor as they advance to encircle the ISIS bastion of Raqqa on Feb. 21. They're in the opening stages of a major military operation that officials say could last into the fall. What comes next is expected to have huge implications not only for the fate of ISIS but also for the relationship between Turkey and Russia, as well as the geographic outlines of the future Syrian state. Turkish Foreign Minister Mevlut Cavusoglu recently sent a clear message about his country's stance on the Syrian Kurds. "We do not wish any of our allies to stand with terrorist groups," he said. The U.S. commander overseeing the ISIS fight, Lt. Gen. Stephen Townsend, said the operation in Raqqa will include Kurdish fighters — emphasizing they, too, are Syrian. "The facts are, there are Kurds from Raqqa and larger Raqqa District and province," Townsend said. "So there are Kurds from there, local Kurds who will participate. I don't think we're going to change the demographics of Raqqa by Kurds or Turkmen or any group participating in the operation." After U.S.-backed Kurdish forces captured the Syrian town of Manbij from ISIS last August and then began moving farther north, Turkey launched what it called Operation Euphrates Shield, which pitted Turkish-backed forces against these Kurdish-led forces, as well as against ISIS. "The increase in the number of forces and patrol forces reassured the people of Manbij," said Shervan Darwish, a Kurdish member of the Manbij Military Council. "It was a very welcome step because the threats directed towards Manbij were a source of worry for the people, especially threats by Turkey. The increase of the American presence in the area ... quieted people's fears." Middle East observers warn, however, that the Turks have the ability to poke the United States if Washington's tactical alliance with disfavored Kurds grows into a stronger political relationship. Ankara could cut off American access to an airbase from which warplanes now support the war in Syria — or deploy more of their own forces to key areas over the border. Saudi Arabia's deputy crown prince and minister of defense, Mohammed bin Salman, repeated that promise last week. The Turks have said they, too, want to participate in the Raqqa operation — but have yet to talk about troop numbers, officials say. Erdogan has said an anti-government group with which he feels comfortable — the Free Syrian Army — could lead the Raqqa offensive. Washington's position is not clear; Townsend would not detail the state of negotiations with Middle Eastern allies. The Turks, meanwhile, have pressed for larger numbers of U.S. ground troops — many thousands — for Syria. But that seems to be a nonstarter. All indications are that President Trump will largely follow the strategy of President Barack Obama: send in U.S. trainers to arm and assist local fighters; allow special operations forces to accompany local combat units and provide airstrikes and surveillance for the local forces. "American and coalition air power is important in support, but cannot, itself, take the lead on liberating Raqqa and other cities from thousands of entrenched ISIS fighters," wrote Michael O'Hanlon, a defense analyst at the Brookings Institution, in The National Interest. "The solution to this conundrum has to involve providing arms to the Kurds, whether Turkey loves the idea or not." To move forward on the Raqqa plan, the U.S. is considering sending hundreds more U.S. trainers — and more special operations forces — to Syria in the coming weeks. Defense Secretary James Mattis has yet to sign off on the plan to send those troops to northern Syria, near the town of Kobane. If he does, the total number of U.S. forces in Syria will approach 3,000. Gen. Joseph Dunford, chairman of the Joint Chiefs of Staff, recently sat down with his Turkish and Russian counterparts to talk about how to handle the situation. One possibility could be carving out zones of operation, so that Russia and Syria would continue operating in areas like Palmyra and the U.S. could focus on Raqqa, defense officials say. "It's about as complex an environment as it can be," Dunford said. "If you just look, you've got Iran there, you've got Russia there, you have the Syrian regime, obviously; Turkish concerns, Kurdish concerns, Arab concerns, Shia concerns, Sunni concerns. ... What I think is, what you're getting at is, we do need to have a vision of how our military actions set conditions on the ground that actually then become the platform ... to come up with a political solution." The way ahead for the Trump administration amounts only to a " 'supersize' of the Obama plan," says Jennifer Cafarella of the Institute for the Study of War, which laid out a blueprint last week for the way ahead in Syria. But that isn't enough, she argues. Today, Carafella argues the U.S. is too focused on the anti-terrorism fight and not on a more important counterinsurgency effort that focuses on the population. "We're not winning the fight for popular support," she says. ISW's report calls for the U.S. to send in some 10,000 combat and support troops to seize a foothold along the Syria-Iraq border and then, with local Arab partners, mount clearing operations northwest toward Raqqa. American officials have begun looking down the road to the future of the Syrian state, they tell NPR. Their analysis begins with the reality on the ground: The Russians have propped up Syria's strongman, Bashar Assad, and helped him secure a long stretch of the country in the south and west. The Kurds have two enclaves in the north. And Sunni Arabs are are in control along both the Iraq and Jordanian borders. Trump administration officials are looking at encouraging some form of "confederation" in Syria once the fighting stops and will press Sunni Arab countries to help rebuild Syria in an effort that would cost hundreds of billions of dollars. O'Hanlon, of the Brookings Institution, says having "autonomous zones" in a confederation seems to make sense. And he says such an effort would require "some number of American forces" to help monitor the movement of people and impede the movement of arms across the Syria-Turkey border. There would very likely be a need for a long-term Turkish presence as well in northern Syria, he says, because Ankara might want to keep an eye on what it perceives as a potential threat. "If there is one thing we should have learned by now in the Middle East," O'Hanlon says, "it's that military successes built on weak political foundations won't last — if they can be achieved in the first place." U.S. forces are playing a bigger and more direct role in the fighting in Syria. This week they have increased air strikes around the ISIS stronghold of Raqqa. American special operations troops have rappelled out of helicopters along with local troops to begin an attack on a strategic dam held by ISIS. The Pentagon says a push to take the city of Raqqa is coming soon and the U.S. will play a key role. To talk more about that, we're joined by NPR's Pentagon correspondent, Tom Bowman. Hello. TOM BOWMAN, BYLINE: Hey, Kelly. MCEVERS: And Middle East correspondent Alice Fordham, who is in Beirut. Hi there. ALICE FORDHAM, BYLINE: Hi, Kelly. MCEVERS: All right, Tom, let's start with you. We are going to see more big U.S. operations in Syria. What is the plan? BOWMAN: OK, what we're seeing is a more aggressive version, Kelly, of the Obama strategy. It's not really a new Trump plan. And it's worked with, trained, in some cases accompanied local rebels and had the U.S. serve as its air force. And along these more aggressive lines you're going to see two things pretty soon, I think. The U.S. plans to send in hundreds more trainers in special operations forces. Defense Secretary Jim Mattis hasn't really signed off on that yet. And also, the U.S. will send weapons - small arms, heavy machine guns, tank rounds - to U.S.-backed Arab and Kurdish forces for this final assault on Raqqa. And Kelly, that last part, supporting Kurdish forces, is a problem for America's ally Turkey. They see all these Kurds as terrorists. So a big question is how will Turkey react? MCEVERS: And, Alice, I'll put that question to you. I mean, what's Turkey's plan? FORDHAM: Well, I've spoken to a few people in Turkey and who analyze Turkey, and no one's exactly sure what the response would be. But Turkey has a number of options that could make these U.S.-led operations in Syria very difficult. So the most disruptive thing that they could do would be to stop the United States and its allies using an airbase called Incirlik in southern Turkey, which is where a lot of the planes in the anti-ISIS fight fly from. A less what you might call nuclear option and something they have done before is to use their own forces and their proxies inside Syria, some of which are themselves supported by the U.S., to attack these Kurdish-led factions. That has already happened near a town called Manbij after it was retaken from ISIS. And when that happened, American forces actually intervened in support of the Kurdish ones. Now, what some analysts say is that a real risk for the United States as it upsets troop numbers in Syria is getting drawn into de-escalating feuds like this between different factions and regional powers. MCEVERS: Right. I mean, Tom, there are a number of factions involved in Syria - right? - the Syrian government, also Russia, Turkey and Iranian-backed militias. I mean, many of these are not allied with the U.S. or with each other. How is the United States going to handle operating in such a complicated environment as it goes after Raqqa? BOWMAN: You know, Kelly, that's a key question that people are looking at right now. Now, officials, of course, have talked about possible safe zones for civilians. And just yesterday, Secretary of State Rex Tillerson raised what he called zones of stability once ISIS has been cleared. But there are also discussions about how do you separate these warring parties that you just mentioned? Now, you do have what you might call zones of interest, such as the Americans and its rebels around Raqqa, the Russians and the Syrians around Aleppo and let's say Palmyra. Basically, each side has a section they're responsible for. No decisions on that yet, but that's something they're talking about. MCEVERS: Does that mean the Trump administration is going to be committed to the area around Raqqa long-term? I mean, something the Obama administration was loath to do. BOWMAN: Well, clearly what I'm hearing is the U.S. will likely be part of any hold force around Raqqa once ISIS is pushed out. Now, they could be on the outskirts of the city and you could see local forces actually patrol inside the city and, of course, police. But yeah, you're looking at what will likely be a U.S. presence in Syria for some time. And clearly next door in Iraq we're going to see thousands of U.S. troops. They've already talked about a more permanent presence in Iraq. MCEVERS: Alice, do we have any sense of how this ramping up of military action around Raqqa is impacting the people there? FORDHAM: Sure. We've been able to reach people who have relatives in the area. Tom, you mentioned attacks on bridges. The coalition actually says that over the course of its air strikes on Raqqa they have destroyed 18 bridges over the river Euphrates, which is designed to restrict the movement of ISIS. But people there say, I mean, that it's very difficult for them to flee. What they see is a significant uptick in air strikes that is causing civilian deaths and injuries. MCEVERS: NPR's Alice Fordham in Beirut and Tom Bowman at the Pentagon. Thanks to both of you. FORDHAM: Thanks for having me. (SOUNDBITE OF DEIA SONG, "ELECTROMANA") Transcript provided by NPR, Copyright NPR.